Proposed Rule to Protect San Francisco’s Miracle Manzanita to be Released Tomorrow SAN FRANCISCO— In a major advancement in one of San Francisco’s most important biological discoveries, the U.S. 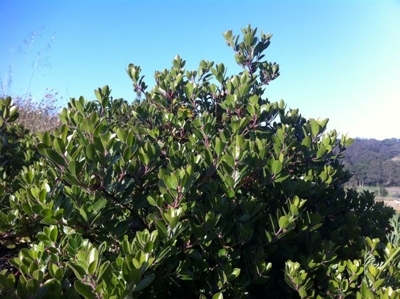 Fish and Wildlife Service will propose to list the Franciscan manzanita, Arctostaphylos franciscana, as an endangered species under the Endangered Species Act in the Federal Register tomorrow. It is the first species to be listed by the Fish and Wildlife Service in response to a citizen petition under the Obama Administration. “The Endangered Species Act gives us the best tools available to protect and recover the rediscovered Franciscan manzanita,” said Brent Plater, Executive Director of the Wild Equity Institute. “Coupled with the Bay Area’s best minds in the manzanita business, the day will come when this species is once again a functioning part of our biological community.” “We’re pleased this rare plant is getting the protection the species so desperately needs to survive and recover,” said Jeff Miller, conservation advocate with the Center for Biological Diversity. “Hopefully this signals that Fish and Wildlife Service has turned a corner on protecting endangered species.” “We welcome this decision by the US Fish & Wildlife Service,” said Greg Suba of the California Native Plant Society. “The long-term protection of this species is now more likely as it continues its extraordinary conservation success story.” In 2009 Dr. Daniel Gluesenkamp rediscovered the Franciscan manzanita, presumed extinct in the wild for over 60 years, while exiting the Golden Gate Bridge into San Francisco. This subtly charming flowering shrub was only known from San Francisco, but it was tragically lost despite heroic acts by botanists striving to keep the species alive. In a last act of desperation, in 1947 botanists stood in front of earth-moving equipment to wrest the last known wild plants from a construction site. The plants were sent to a botanical garden, and no one found the plant in the wild again: until Dr. Gluesenkamp’s miraculous discovery. The individual plant was subsequently moved to a more secure location in the Presidio to avoid disturbance from the ongoing construction of the Doyle Drive project. While the individual plant was saved from immediate threat, no formal protection was provided to ensure the entire species recovered. The proposed rule will provide formal Endangered Species Act protection for the plant: it requires creation of a binding recovery plan for the species; it prioritizes federal funding for the species’ recovery efforts; and if found prudent, it ensures that the species’ critical habitats, both those currently occupied and those that are needed for reintroduction, are protected. Tomorrow’s announcement follows a formal listing petition submitted by the Wild Equity Institute, the Center for Biological Diversity, and the California Native Plant Society, and subsequent litigation by the Wild Equity Institute when the proposal was delayed. The proposed rule was finally released on the day that the Fish and Wildlife Service’s responsive briefs were due in the litigation. The Fish and Wildlife Service will take comments on the proposal, including comments on the areas that should be designated as critical habitat for the species, for the next 60 days. A public hearing may also be held, if requested. To submit comments, go to the regulations.gov rulemaking portal, and enter FWS–R8–ES–2010–0049 in the keyword search box. For more information about the Franciscan Manzanita, please visit our website at wildequity.org.